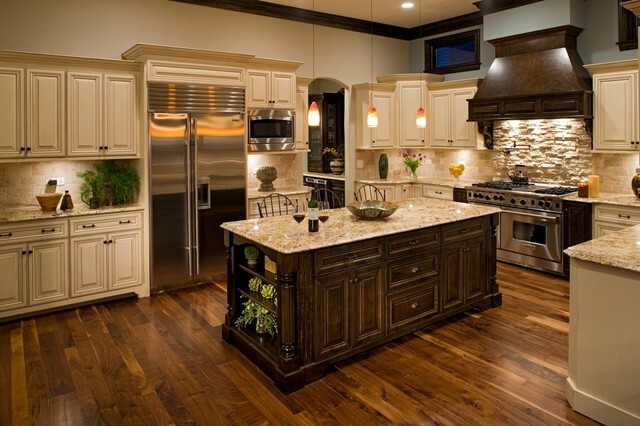 Picture credit: gandmexpresss Two toned cabinets and light color flooring make a stunning kitchen design. Lets talk about the sun dried red seedless raisin, before I introduce Giallo Napoli Granite: Red seedless raisin is semi transparent if you hold it in between your fingers and look at the light. In her perimeter, you can see some golden dusts. So if you are happy with this image, you stand on the right spot. Giallo Napoli Granite has a lot of red seedless raisin inside on her golden dust surface. For me, the color of the football team. The Washington Redskins, which is not regretted and loved forever. Giallo Napoli Granite is a homogeny and simple Brazilian Lady. Her earth color tones like burgundy, golden cream, soft charcoal grays and browns bring her chic looking. In the first sight, she looks like Santa Cecilia Granite, but the homogeneity of her is identified if she is compared with Santa Cecilia. She belongs to the same family of Giallo Ornamental, New Venetian Gold, and Crema Gold. Her other well-known name is Giallo Napolitano and Giallo Napoleon. Her grandmother is Santa King. Everyone can love Giallo Napoli Granite. Since her feature is light earthy tones, you can see her as a backsplash as well. Her personality matches well with off white, white, cream, all tones of cherry and brown tones of cabinets. In these days, she goes well with gray tone natural stone backsplash and white or cream tones cabinets. If you would like to have natural cream tones travertine backsplash or glass backsplash for your cherry, brown or dark color cabinets, she will pop up as a golden star in your kitchen. The flooring for this cutie is usually light colors to make enough opposite attraction. After seeing the pictures that I picked for your review, please drop a comment and participate to make her happier. Thank you for choosing her in your kitchen remodeling. If you need some backsplash ideas with white cabinets and dark cabinets, please feel free to visit my other articles. Picture Credit: Case Remodeling of Charlotte via Houzz. The most completing element in this kitchen is the diagonal, gray tones ceramic backsplash and cherry color flooring. Ready to cook looking. Picture Credit: KCCabinetry. Giallo Napoli Granite with molasses color and midnight frost glaze cabinets. Embellished travertines. Giallo Napoli Countertop with White Linen Glazed Kitchen Cabinets and Gunstock Stained Island, Split Face Travertine Mosaic Backsplash. Black American Walnut Flooring is Bonus. Picture Credit: Oakley Home Builders. White linen glazed cabinets and gunstock stained island match very well with Giallo Napoli Countertop, black American Walnut Flooring and Stacked stone mosaic tile. Picture Credit:Jorn Sales & Marketing Inc. Giallo Napoli in off white kitchen design. Love all the details. Picture Credit: Huntsville Granite & Marble. 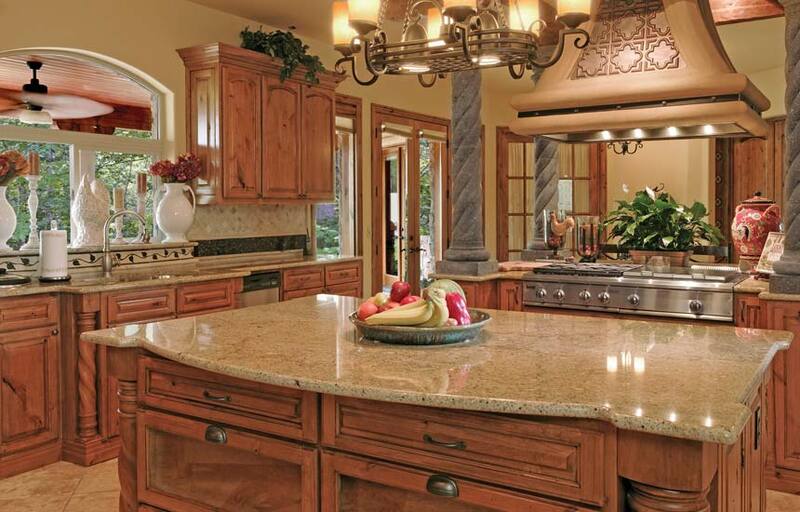 The harmony of rustic cherry and giallo napoli granite is magical. Leaf motives border backsplash and black glass tiles and white travertine backsplash have chosen with fine taste. All picture seems very elegant and representable. I am hoping that the pictures find you well. 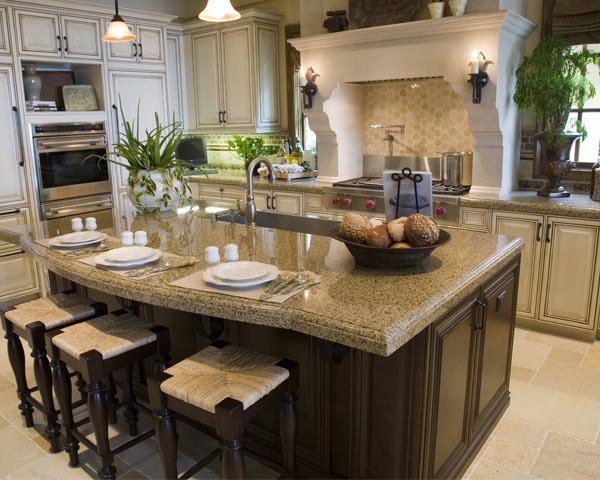 If you would like to know about the granite material, I may suggest you to check the Granite Countertop : Kitchen Countertop Materials article of mine.